I first self-published on Amazon Kindle's Digital Text Platform in April of 2009, as a favor to some fans. Back in 2005, I put some free ebook downloads on my website, JAKonrath.com. These were books that my agent tried to sell, but NY didn't want to buy. I posted them on my site, for free, figuring they could be used as a gateway drug. Give readers a taste, and if they like it, maybe they'll go on to buy some of my print novels and I'll make a few bucks. In 2009, several fans emailed me, saying they wanted to read my free ebooks on their new Kindles, but Kindle couldn't (yet) read pdf files. Was there any way I could make the ebook Kindle-friendly? It turned out there was. Going to dtp.amazon.com, writers could upload their ebooks to Kindle for free. So that's what I did. For price, I set it under $2.00. I figured this was a loss lead, meant to steer people toward my print novels. Since then, I've sold over 46,000 ebooks. About 16,000 of those have been The List. You can order it HERE for $1.99. To say I'm shocked by how many copies this has sold is putting it lightly. My other ebooks are doing well, but this one is clearly the runaway hit. It's had 62 customer reviews and counting, which is more than the majority of my print titles have gotten. It's been the #1 seller in the Amazon Kindle Store Police Procedural category for six months (I currently have 12 ebooks in the top 100 in that category.) And I get more fanmail about The List than I do about my Jack Daniels series. What is it about this particular book? I wish I knew. Maybe it's the cover. Maybe it's the description. Maybe the sample excerpt, which can be downloaded for free, hooks people. Maybe it's word of mouth. Maybe it's the title. Whatever it is, the sales are double any of my other ebooks. It's currently selling 80 copies a day, and shows no signs of closing down. Here's what fascinates me: I would assume that 16,000 self-pubbed ebook sales are impressive. In fact, I would think they'd be impressive even by NY publishing standards. Compare that to the 2500 ebooks Whiskey Sour (my first novel) has sold, and it's taken six years to sell that many. So why hasn't any major publisher looked at this ebook and made me an offer? I assume some industry professionals read my blog. I've been making a lot of noise over the past year about ebooks, and most editors are tech savvy and pay attention to Twitter and Facebook and the blogosphere. Yet no one has approached me with a deal, even though this ebook is outselling major bestsellers. After all, it is ranked on Amazon higher than Kellerman, Robb, Connelly, Crais, Patterson, and everyone else. Wouldn't it make sense to release a print version? So that's what I'm doing. 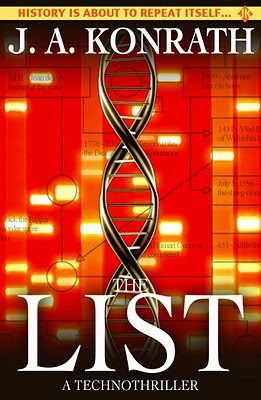 Next month, using Amazon's CreateSpace program, I'm self-publishing The List as a low-priced trade paperback. I'm curious how it will do, and I'll let you know when it's available. I'd also like to announce that next month I'm self-publishing two original horror novels on Kindle. And guess what? Both of these did have offers from large NY print publishers. But I have decided to put my money where my mouth is and release them on my own instead. The future is now. Any questions? Q: Is The List available on other platforms? A: Yes. Through Smashwords.com, they're available on Nook, Kobo, and iPad. You can get The List, and my other ebooks, on these. It is also coming soon to the Sony reader. Q: How many copies have these other platforms sold? A: I don't have the numbers yet. Amazon reports monthly. Smashwords reports quarterly. Q: Who were the publishers who made offers on those two horror novels you're putting up next month? A: I don't think it's nice to kiss and tell, especially since they are both publishers I like and respect. If you don't want to believe me, no one is forcing you to. But my close circle of friends know who they are. Maybe you can get one of them drunk and pry the info out of them. Q: If The List is your bestseller, how are your other ebooks faring? A: Origin comes in second, with almost 10,000 sold. It's currently ranked #241 overall in the Kindle Store. Then come my novels Disturb and Shot of Tequila, ranked #846 and #832. Which means I currently have four self-pubbed ebooks in the Kindle top #1000. Not bad, considering there are over 500,000 ebooks available on Amazon. My novellas and story collections are all ranked above 10,000, most of them above 3000. Q: Are you going to do print editions of your other ebooks? A: Absolutely. They should all be available by the end of the year, including the two new ones. Q: So from now on are you only writing for Kindle? A: Yes. After I've met my current contract obligations with print publishers, I will devote my full time to Kindle and other ebook platforms. I really doubt I'll ever accept a print deal again. Q: Do you still need an agent? A: Absolutely. She still does a lot for me. In the past few months, she's vetted several contracts (including the one for Shaken with AmazonEncore), done two movie deals for me, and is currently working on audio and foreign rights sales. She's essential. Q: Do you recommend bypassing print publishing to new authors? A: I recommend new authors learn their craft, write great books, set appropriate goals, and decide what works for them. The print industry has been incredibly good to me. I've worked with some fabulous people who have done wonderful things for my career. I feel like I stumbled upon this ebook thing, and it has snowballed into something pretty big. That doesn't mean it will snowball for everybody. Q: I'm a reporter. Can I quote this piece and take excerpts?